and a stunning conference facility within the tranquility and lush surroundings of the pond and the park. For information about education and recreation programs offered at the Baldcypress Nature Center. The center is also available for meetings, conferences and other events. Since the park’s beginnings, teachers and naturalists have taken advantage of Trap Pond’s breathtaking landscape for their outdoor education programs. However, until fall of 2012 there was no building where visitors could learn about the rich natural, cultural and recreational aspects of the park. Today, thanks to involved community members, dedicated park staff and the National Park Service, we have a facility designed to connect visitors to the natural and cultural history of the area. The new Baldcypress Nature Center also provides ample space for educational programs, meetings and get-togethers. With its exposed wooden beams and cypress shingles, the building reflects the rustic nature of the park and the influence of the Civilian Conservation Corps. A large exhibit area showcases the natural and cultural history of the Trap Pond Region, with water and the millpond’s connection to the Chesapeake Bay as a central theme. Completing the public space at the Nature Center is a large multi-purpose room, opening onto two patios, all with stunning views of the pond and park. Staff offices, a kitchen for public events and restroom facilities make the building suitable for many uses. 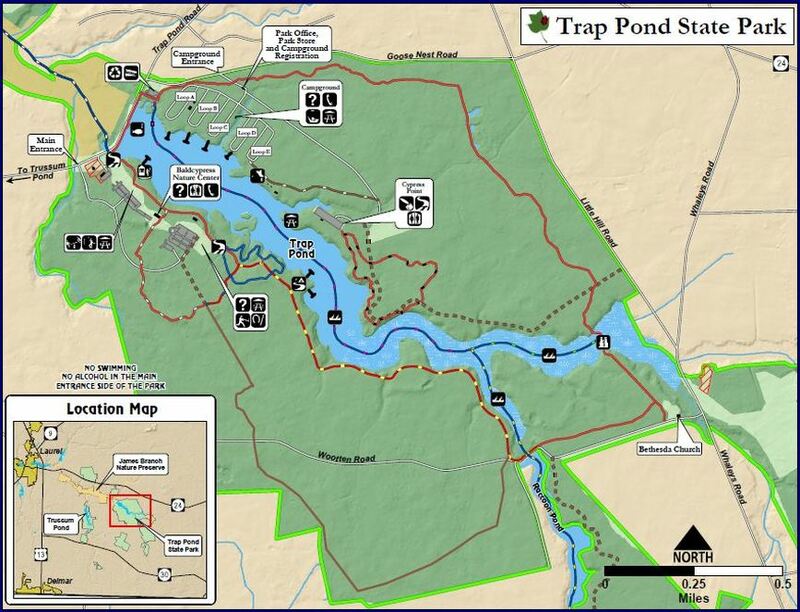 Delaware State Parks and the staff at Trap Pond encourage visitors to explore the new Nature Center, discover the park’s history and recreational opportunities, and experience the natural wonder that is Trap Pond.